The Public Governance Institute facilitated the ribbon cutting ceremony and celebration for the winners on June 28, 2007 in the historic Cannon Caucus Room. Appearing as special guests were acclaimed artist Antonio Martorell, and actress Emily Osment from the Disney Channel’s Hannnah Montana. One Republican and one Democrat Member of the U.S. House serve as co-chairs of the competition, which is open to all high school students in all Congressional Districts. Co-chairs for the 2007 competition were Representatives Luis G. Fortuno (R-PR) and Madeleine Z. Bordallo (D-GU). Senator James Jeffords (VT) created the competition when he was a member of the House of Representatives. Since that time, the collection has grown from less than 20 entries to well over 350 today. Contests are held locally by Members of Congress, and art by all first-place winners is displayed in a walkway between the House office buildings and the U.S. Capitol.The exhibit is a favorite point of interest in the U.S. Capitol. 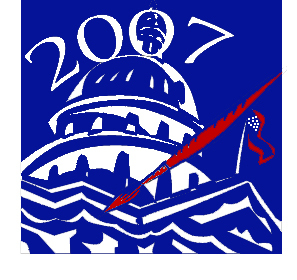 The annual competition and celebration is one of the most popular events in the U.S. House of Representatives.